The word ‘logo’ can be an unwitting source of frustration in the design process. This mostly happens because a logo is made of several different parts, each with their own name. Because those names aren’t well-known or understood outside of the design world, all of the parts just get called ‘logo’ and that can lead to confusion during edit requests or applications of your branding. But once you break it down and understand the different parts, it’s really not that hard to have a productive conversation about your logo. This is the graphic representation of your company, or pictorial part of your logo. It can be a shape, an object, a letter or small group of letters, or something abstract. The key is that it is stylistically distinct from the business name. It is generally part of the overall logo, either above or to the side of the business name, or incorporated into it by replacing a letter. But it does not have to be part of the formal logo; it can exist separately as something you use in spaces where your full logo won’t fit or isn’t needed. For example, my logo does not have a logomark incuded in the full version. But I do have a mark that exists separately (the capital G on its own) that I use in smaller spaces: the footer in invoices/proposals; the favicon of my site; stickers to seal things I mail. In those places, the full logo would neither fit well, nor is it needed. But a simpler representation of my brand works in these places to reinforce my look. A great example of a logomark that stands on its own is Apple. You see that little fruit everywhere, and it almost always exists on its own without ‘Apple’ spelled out beneath it. This is your business’ name, spelled out in full. It is the part of a logo that a person reads. The words have a set style and always appear in that same style- it’s not (or shouldn’t be) just any old font slapped next to the logomark. The shape of the letters, the specific weight and spacing, and the size of the letters in relation to the logomark should always be consistent. It is generally limited to one or two distinct type treatments, which may be used in other brand materials for a cohesive visual look. Fonts and hand-drawn type all have different personalities and associations that people pull from them, so these should be chosen or created carefully. They need to not only reflect the personality and values of the business, but also work in conjunction with the logomark (if there is one). Readability is also a concern, since your logo will appear at many different sizes in different settings. There may be a hierarchy to parts of the business name. 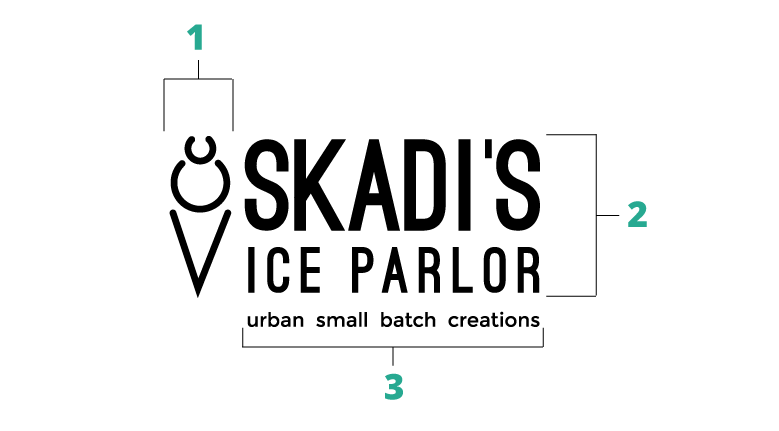 Skadi’s Ice Parlor, for example, emphasizes the distinguishing part of the name ‘Skadi’, and places ‘Ice Parlor’ with less prominence. This is still all the logotype, since ‘Ice Parlor’ is part of the business name; it should not be confused with #3 below. This is an extra part of the logo that may or may not be necessary for your business. It provides additional information about your company. If you need to further clarify what your business does or offers, or if you need to include something like ‘Established 2010’, this is the way to do it. Generally a tagline or subtitle will be beneath the logo, in smaller type, in a similar or complementary font to the logotype. Even if you opt to include a line like this in your full logo, you’re going to want to make sure you also get versions of your logo without it, just so you have options for future needs. In rare cases, you might see the tagline used more often than the business name written out. Best example? Think of Nike. You most often see either their swoosh mark on its own, or with Just Do It beneath it. Seeing ‘Nike’ written out is far less common. All of these parts together make what you refer to as a logo. If you need to refer to just one of the parts, make sure you’re using the term that will help indicate which one you mean. Saying ‘the logo needs to be smaller’ when you really mean the logomark needs to be smaller will not get you the result you want. A final note: you don’t strictly need all 3 parts in your logo, and even if you have all 3, you don’t necessarily need to use them all together. You can use just one part if it has enough strong brand recognition for it to stand on its own. And that is really the key. Whatever parts your final logo includes, you want to make sure that it’s a good fit for your brand. Did you find this explanation of logo parts useful? What other design terms or ideas would you like decoded? Need to brush up on other design terms? Check out Decoding Design on: Color Lingo; Web Lingo; Print Lingo. Wonderful post! I’ve seen some horrific examples around lately so I think this needs to be shared widely!